Dryer vent pipes, properly called vent ducts, come in a variety of materials. Most dryer duct is round and 4 inches in diameter. Some are flexible and others are rigid. Since all types are sold for use with dryers, you would naturally assume that all are suitable for this application. Unfortunately, that is not the case. Vinyl duct, and in some situations, all flexible duct, is not allowed by building codes. Also, dryers may come with manufacturer’s specifications for ducting to use with a particular model. Here are the most common dryer duct materials you might use to install a dryer vent. Most, if not all, can be found at your local hardware or home improvement store. Note: The best way to ensure a duct is safe for your installation is to look for a product that is listed, or certified, by a national testing laboratory, such as UL (Underwriters Laboratories). Building codes often specify "listed" or "L and L" (listed and labeled) duct for all new installations. Made of flexible aluminum foil, this is the most common type of dryer transition ducts — those that connect from the appliance to the main duct that runs to the outdoors. 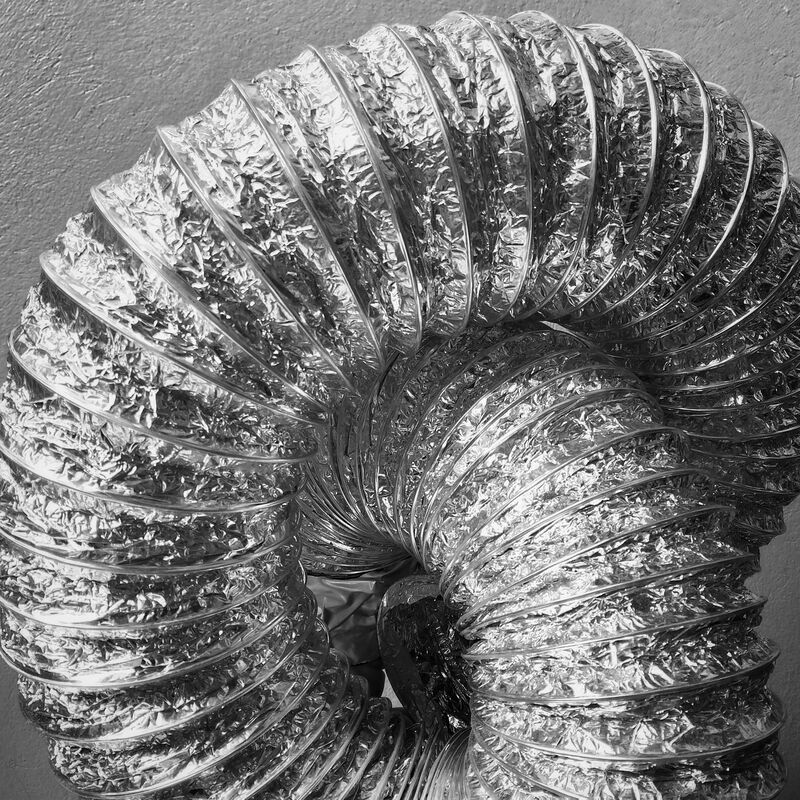 Foil duct can accordion from about one to eight feet, which is usually enough for most installations. Double-check to make sure that this type is approved for your dryer and allowed by local code. Transition ducts must not be concealed inside walls or other building cavities and usually have a maximum allowed length of eight feet. Foil duct is held in place with dryer clamps or large hose clamps. Metal tape can be used, too, but clamps make it easier to remove the tubing for cleaning. Semi-rigid metal (usually aluminum) duct is flexible and similar to foil ducting but quite a bit more rigid. 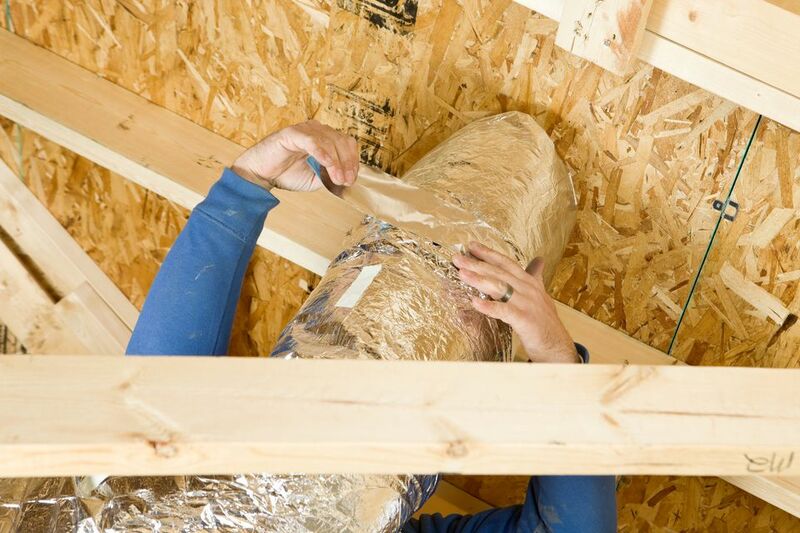 Like foil duct, semi-rigid is used only for transition ducting and should not be concealed in walls or floors. It is typically installed with clamps. Although semi-rigid metal duct is often stronger and has a smoother interior (catches less lint) than foil duct, it is more common to find listed foil duct than listed semi-rigid. Slim duct, sometimes called periscope duct or known by the brands Tite-Fit or Skinny Duct, is a telescoping rigid aluminum duct designed for transition ducting in tight spaces. It has a wide rectangular shape except for the two ends where it connects to the dryer and the vent outlet. It allows you to push the dryer very close to the wall. This can be a great space-saver as long as the dryer and the vent are close together. Most slim ducts can be adjusted from about 27 inches to about 48 inches in length. It is also adaptable to vertical, horizontal, and diagonal installations. Rigid metal duct is the only suitable duct material for concealed duct installations; that is, the portion of the duct run inside walls, floors, or other areas where the duct is not fully visible. Available in aluminum and galvanized steel, rigid metal duct is very smooth on its interior, so air flows through with little friction, and it catches the least amount of lint of any duct material. Because rigid duct cannot be bent, it is assembled with elbow fittings that allow the duct to turn 45 or 90 degrees, depending on the type of elbow. Note: Always use metal duct tape to secure the joints; don't use screws, because they catch lint. Do not use regular plastic duct tape because it dries out and deteriorates. Flexible plastic (usually vinyl) duct is similar to aluminum foil duct but has a thin plastic wall rather than metal foil. Despite its popular use for many years, plastic duct is not allowed by most building codes. The ribbed interior of flexible duct easily catches lint. If the duct becomes blocked with lint, the duct can become very hot and potentially catch fire. This hazard has resulted in numerous house fires. Plastic duct is the least-safe option, and you will not find a listed product made of this material. The bottom line is, don't use it.